In my days as a geologist, I was well aware of salt as the mineral halite. Primarily because, as less than mature students, we all dared each other to lick the mineralogy lab sample that had been touched by hundreds of undergrads every year. I’m not proud to say I know what it tasted like: old salt. I also vividly recall when traveling to Israel at the age of 12, I inadvertently got a mouthful of salt water while floating in the Dead Sea. That is a taste you can never expunge from your gustatory memory: ancient salt. Why is salt on my mind? Because no matter what mineral or color additives it includes, to me, table salt will always be salt. NaCl. Sodium Chloride. Common salt. The workhorse of the home cook. A quick review of our pantry shows me kosher salt, fine sea salt, rock salt, French Atlantic sea salt, iodized salt, and black salt from Hawaii: varietal salts. The Branding Gods who reside at Morton must have had a field day with this one. I fondly remember the extra fine Morton popcorn salt we used as kids because it stuck so well to the popcorn. I also remember the “fun” chore of churning ice cream in our wooden bucket ice cream maker filled with ice and rock salt. But who does it that way anymore? Our Krups ice cream machine uses a frozen core base. No salt required. So, was the packaging team bored with just the iconic Morton navy blue? Did their focus group research show that the ice cream display inspired purchases? I do suspect it’s a straightforward nostalgia play, and I can’t help but wonder if it’s led to an uptick in sales. Pete bought it because he needed a little rock salt. 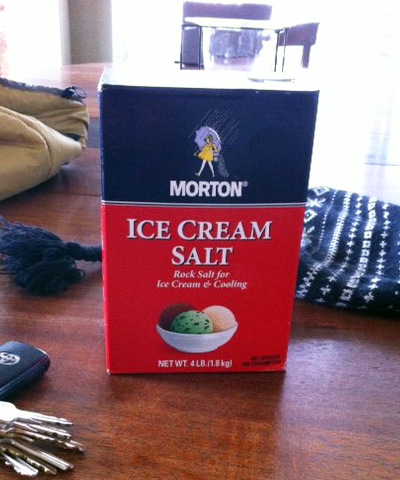 So he now has 4 lbs of “ice cream salt.” When Restoration Hardware fuels the next ice cream grinder resurgence five years from now, I expect Pete will still have some around for me to borrow.